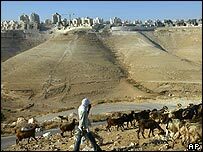 Israel's housing ministry has issued tenders for 72 new homes on a settlement in the West Bank. Housing Ministry official Kobi Bleich said the buildings would extend the Beitar Ilit, south of Jerusalem, near the Palestinian town of Bethlehem. Palestinian Planning Minister Ghassan al-Khattib described the planned development as a "provocation to the Palestinian people." Construction of the new homes could start within a year. Beitar Ilit is already home to more than 20,000 settlers. The extension of the settlement would make it part of the Gush Etzion settlement bloc. US President George Bush has warned Israeli Prime Minister Ariel Sharon against further settlement expansion in the West Bank. The expansion also contravenes commitments made by Israel under the US-backed roadmap peace plan. A spokesman for the housing ministry said the homes were "a natural development of plans that were approved in the past within the existing borders of Beitar Ilit". The ministry has issued tenders to build 235 housing units in West Bank settlements so far this year. Over 400,000 Israelis live in 150 settlements in the West Bank and East Jerusalem.